The history of Tanque Verde Ranch is linked to the Pima Indians. The “Tanque Verde” Ranch means “green pool” and was a seasonal river used by the Pima Indians for water. The land was purchased in 1868 by Emilio Carrillo. Carrillo, was a Mexican hacendado (owner of a large estate) from Santa Cruz. After Carrillo’s death in 1908, Jim Converse acquired the land began inviting eastern “dudes” to visit and take on various ranch activities. He extended the cattle herd on the ranch as well as visiting tourists until 1955. Brownie Cote purchased the property in 1957 and created the classic western dude ranch and world class resort Tanque Verde Ranch is know for today. The Cote family continues to operate the ranch. Tanque Verde Ranch Resort, on the east side of Tucson, has been named “Best Dude Ranch in Arizona” by Arizona Republic in 2012, A “Top Ten Family Resort” by the Travel Channel since 2007 and a “Top Five Ranch” by Conda Nast Traveler in 2008. It has also won the Silver award for Outstanding Southwestern Cuisine by Tucson Lifestyle Magazine in 2013. Since its founding in 1868, Tanque Verde Ranch continues the tradition of outstanding accommodations, amenities and a host of activities to be experienced and enjoyed. 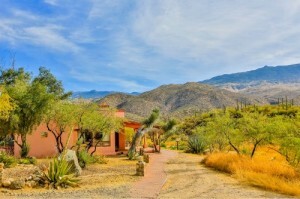 This upscale guest ranch is proudly located on over 600 acres of the Sonoran desert on the east side of Tucson AZ. The Rincon Mountains, adjacent Saguaro National Park – East and Coronado National Forest provide a backdrop for a unique and memorable experience. Once settled in, the fun begins. Among the many activities available are horseback riding, guided trail hiking and cycling, swimming, dancing and – who would have thunk it – fishing. Tennis and basketball courts are also available. And for those staying between late December and late March, skiing is available on nearby Mt. Lemmon. Based on your riding experience, select one of the Ranch’s 180 horses and ride out into the Old West. Knowledgeable guides provide their expert instruction and will lead you on a scenic journey through the trails of Arizona. For those with luxury in mind, the La Sonora Spa is for your. Whether it is after a morning ride or a need to just wind down, the La Sonora Spa at Tanque Verde Ranch is the place. Indulge yourself to a massage or skin renewal treatment with products that are a 98% organic. All are made from fruits, vegetables, spices and herbs. The spa’s indoor pool provides views of the Rincon Mountains. The spa whirlpool will sooth the body and get you ready for dinner and lots more activities to be enjoyed. Traditional adobe walls and Santa Fe style architecture perfectly complement the beauty of the natural surroundings. Tanque Verde Ranch offers a range of rooms that offer spectacular views of the mountains and desert that surround the facility. After a hard day “on the trail”, you can retire to a luxurious room decorated in rich southwestern style. Tanque Verde lodging blends the spirit of the Old West with today’s modern luxury accommodations. Oh! Did I mention the food? Three outstanding meals are served daily in the main dining room. Additionally, specialty dining events are held each week. These include an Old Homestead Breakfast Ride, a Mexican Fiesta Night, and the Cottonwood Grove Ranch Barbeque. Experience southwestern cuisine in the unique setting of the Tanque Verde Ranch! Tanque Verde Ranch creates a welcoming and relaxed get away that blends modern amenities with Old West charm for the whole family. If you want to experience a dude ranch vacation with luxury and amenities, Tanque Verde Ranch should be at the top of your list. The location provides easy access to the City of Tucson and perfect location to start a day trip to Tombstone or Bisbee. For those considering Tucson AZ and a place to live or looking to find a seasonal home, we can help!